The aim of the study was to determine the relationship between the rate of peak early mitral inflow velocity and the peak early diastolic mitral annular tissue velocities in normal controls and to compare them with subjects with diastolic dysfunction. The relationship between early passive diastolic transmitral flow and peak early mitral annular velocity in the normal and in diastolic dysfunction was studied. Two groups comprising 22 normal controls and 25 patients with diastolic dysfunction were studied. Compared with the normal group, those with diastolic dysfunction had a lower E/A ratio (0.7 ± 0.2 vs. 1.9 ± 0.5, p < 0.001), a higher time-velocity integral of the atrial component (11.7 ± 3.2 cm vs. 5.5 ± 2.1 cm, p < 0.0001), a longer isovolumic relaxation time 73 ± 12 ms vs. 94 ± 6 ms, p < 0.01 and a lower rate of acceleration of blood across the mitral valve (549.2 ± 151.9 cm/sec2 vs. 871 ± 128.1 cm/sec2, p < 0.001). They also had a lower mitral annular relaxation velocity (Ea) (6.08 ± 1.6 cm/sec vs 12.8 ± 0.67 cm/sec, p < 0.001), which was positively correlated to the acceleration of early diastolic filling (R = 0.66), p < 0.05. This investigation provides information on the acceleration of early diastolic filling and its relationship to mitral annular peak tissue velocity (Ea) recorded by Doppler tissue imaging. It supports not only the premise that recoil is an important mechanism for rapid early diastolic filling but also the existence of an early diastolic mechanism in normal. The study of left ventricular filling dynamics has only recently received the same attention historically associated with systolic dynamics. Doppler Tissue Imaging (DTI) is fundamental in this assessment as it allows for the determination of systolic and diastolic velocities in the myocardium [1, 2]. A number of studies have proposed that recorded mitral annular displacement and velocity in both systole and diastole may be used as indicators of overall cardiac performance [3, 4]. In normal left ventricular relaxation after systole, the peak mitral annular velocity (Ea) recorded by DTI precedes the peak early passive diastolic transmitral flow (E) recorded by conventional pulsed wave (PW) Doppler ultrasound. In situations where this relaxation is impaired, Ea follows E [5, 6]. This supports the suggestion that elastic recoil is related to mitral annular motion and this early diastolic mechanism of augmenting the onset of mitral flow velocity is lost in patients with diastolic dysfunction . Ea appears to be more reflective of events at the very early diastolic stage in the cardiac cycle, including untwisting or recoiling of the ventricle. [5, 7]. There are animal and human data showing a good but not perfect correlation between the lowest very early left ventricular diastolic pressure (minimal pressure) and Ea, where subjects with low left ventricular minimal pressure have a normal Ea and those with a high minimal left ventricular pressure have a low Ea [5, 7, 8]. This minimal left ventricular pressure reflects the early diastolic recoil where subjects with normal or enhanced recoil tend to have low pressures [5, 7]. Recoil may also be dependent on myocardial interstitial composition, which is altered in patients with diastolic dysfunction . The aim of the study was to determine the relationship between Ea and early transmitral flow in patients with diastolic dysfunction and to compare this with a normal population. The study proposal was assessed and passed the Institutional Ethics Committee. Individuals coming for echocardiographic assessment were screened. Those with echocardiographic features suitable for enrolment in the study were asked to participate. Following informed consent the participants were enrolled. Between March 2002 and September 2002, a group of 22 controls with completely normal echocardiograms and 25 patients with clinical echocardiographic and Doppler evidence of diastolic dysfunction were entered into the study. These patients were asymptomatic and had no previous cardiac failure. Diastolic dysfunction was defined using two-dimensional echocardiography and Doppler techniques as preserved systolic function but with evidence of LV hypertrophy, reversed E/A ratio and a prolonged isovolumic relaxation period . Patients were excluded if they had abnormal rhythm, known coronary artery disease, or valvular incompetence beyond a modest degree, or if echocardiographic images were technically inadequate for complete analysis. We studied twenty-five patients of mean age 61.5 (SD 13.3) years in the diastolic dysfunction group and twenty-two normal controls of mean age 33.4 (SD 18) years. Fifteen patients from the diastolic dysfunction group (10 male, 5 female) had been referred to the Hypertension clinic. These patients were evaluated for essential hypertension and were sent for echocardiography as part of their evaluation. Patients selected for the study had echo evidence of diastolic dysfunction without pseudonormalisation, which would have been unmasked on the tissue Doppler profile. They were subsequently diagnosed as having essential hypertension and treated appropriately. At the time of echocardiographic evaluation they were not on any anti-hypertensive therapy. Eight had electrocardiographic evidence of left ventricular hypertrophy of various degrees. Ten other patients (2 male, 8 female) with diastolic dysfunction consisted of an elderly group who had age-related diastolic dysfunction and were also free of cardiac drugs. These patients were referred for echocardiography for investigating of a systolic murmur. Three of these patients had mild calcific aortic stenosis gradient < (25 mmHg), four patients had basal septal hypertrophy only and three patients had both mild aortic stenosis gradient (< 25 mmHg) and basal septal hypertrophy. These were compared to a group of 22 controls (12 males, 10 females) with clear acoustic windows and no clinical or echocardiographic evidence of cardiovascular disease. Echocardiograms were obtained with an Agilent 5500 cardiac ultrasound system with colour flow imaging and DTI capabilities. The system was equipped with 2.5 and 3.5 MHz transducers. Two-dimensional (2-D) echocardiography was performed followed by a PW Doppler study. The images obtained included the apical four-chamber and two-chamber views so that blood flow measurements could be made across the mitral valve. Also these views made it possible to record the DTI at the lateral mitral annulus. Pulsed wave DTI was performed by activating this function on the Agilent 5500 system. A sample volume was located at the lateral side of the mitral annulus. The characteristic velocity profile of diastole was obtained in all patients. Peak early (E) and late (A) diastolic mitral annular velocities were recorded, as well as the E/A ratio, acceleration time, along with acceleration and time/velocity integrals of early and late filling in each case. Patients who were relatively tachycardic were repeated at another time when the rate had reduced enough to allow us to measure the time velocity integral accurately. Acceleration time of the early diastolic velocity was defined as twice the interval between the point at peak velocity and that at half of the peak velocity in the acceleration phases. Acceleration rate (cm/sec2) was represented by the slope of the line between an anchored point and a crosshair. This linear measurement was made on the velocity spectrum. These recordings were shown on a strip chart with a sweep speed of 100 mm/s to determine correct temporal observations. Measurements were performed off line by an independent observer who had no knowledge of the Doppler or Tissue Doppler findings. At least three measurements were taken of each parameter and these were averaged. Using 2-D echocardiography the end-systolic (ESV) and end-diastolic (EDV) volumes were recorded by the method of disc summation based on Simpson's rule. This method treats the ventricle as a stack of discs and is recommended because it is independent of preconceived ventricular shape . The endocardial border was traced in each phase of the cardiac cycle and the system computer partitioned the ventricle into 20 discs of equal thickness. The computer then summed the individual disc volumes to give the total volume of the cavity. All echocardiographic examinations were performed by an experienced sonographer and / or an experienced physician. To test for inter-observer variability, pulsed wave Doppler tissue imaging measurement of Ea and Doppler profiles (determined by conventional pulsed wave Doppler) were analysed by one experienced observer who was blind to the first examination. A p = 0.05 was considered to indicate statistical significance. All statistical analyses were performed using the BMDP statistical package. Paired and unpaired Student's t-tests were used, as appropriate; to evaluate the difference between the means of the two selected groups and the difference between repeated measures. Because of the wide age range in both groups the means adjusted for age for each variable were calculated using multiple regression. For each group the relationship between DTI diastolic early velocity (Ea) and parameters of left ventricular mitral inflow including the rate of mitral acceleration was expressed using the Pearson correlation coefficient and separate linear regression models that were compared using an R test. Inter-observer agreement is measured using the method described by Bland and Altman (1986). Mean differences and correlations close to zero indicate no bias in one observer compared with the other. Mean differences and correlations for inter-observer variability for Ea (r = 0.07) and other Doppler profiles were insignificant. The early diastolic tissue velocity detected by Doppler tissue imaging was lower in the diastolic dysfunction group than in the normal group (6.08 ± 0.67 cm/sec and 12.8 ± 0.73 cm/sec respectively, p = 0.001). The rate of acceleration was lower in the diastolic group (549.2 ± 151.9 cm/s2 versus 871.1 ± 128.1 cm/s2, p = 0.001) as was the time-velocity integral of early diastolic flow (7.8 ± 2.5 cm versus 10.6 ± 2.9 cm, p = 0.0027). There was a longer isovolumic relaxation time in the diastolic group then the normal (94 ± 6 ms versus 73 ± 12 ms p < 0.01). There were no differences between the two groups in relation to the end-diastolic volume or in the end-systolic volume. There was no change with age for ejection fraction. The E/A ratio was lower in the diastolic dysfunction group compared with the normal group (0.7 ± 0.2 versus 1.9 ± 0.5, p = 0.001), while the time-velocity integral of the atrial component was greater in the diastolic dysfunction group compared with the normal group (11.7 ± 3.7 cm versus 5.5 ± 2.1 cm, p = 0.0001). In view of the age difference between the control and diastolic dysfunction group the data was adjusted for age. The same differences were seen in the various parameters after adjusting for age. The results are given in table 1 and the means adjusted for age are given in table 2. Normal Controls (n = 22). Results expressed as mean ± standard deviation. EDV (ml) = End diastolic volume in millilitres. ESV (ml) = End systolic volume in millilitres. EF % = Ejection fraction as a percentage of blood ejected per cardiac cycle. Ea (cm/sec) = Peak early mitral annular tissue velocity recorded by Doppler tissue imaging. E Acc (cm/sec2) = Rate of acceleration of blood across the mitral valve in early diastole. E/A = Ratio of peak early diastolic flow over peak late diastolic flow. Et VI cm = Time velocity integral of early diastole in centimetres At VI cm = Time velocity integral of late diastole in centimetres. Time to Acc (ms) = Time to peak acceleration of early diastole in milliseconds. Heart Rate (ms) = R to R interval in milliseconds IVRT (ms) = Isovolumic relaxation time. Means adjusted for age. The values presented are adjusted means ± standard deviation. By individual patient analysis patients with diastolic dysfunction had a reduced Ea compared to the normal group. Patients with diastolic dysfunction and an E/A ratio less than one had consistently low mitral annular velocities determined by DTI. There was a positive correlation between the mitral annular tissue velocity with the acceleration of mitral inflow in the diastolic dysfunction group(r = 0.66), which was not present in the control group (Figure 1). The F ratio test, comparing the two regression lines for the two groups, indicated a significant difference (F = 4.44, p = 0.0176). There were positive correlations between the mitral annular tissue velocity with the E/A ratio (r = 0.64, p < 0.001), the time velocity integral of early diastolic filling (r = 0.50, p < 0.02), and the time velocity integral of late filling (r = 0.44, p < 0.05) which was also not present in the control group. 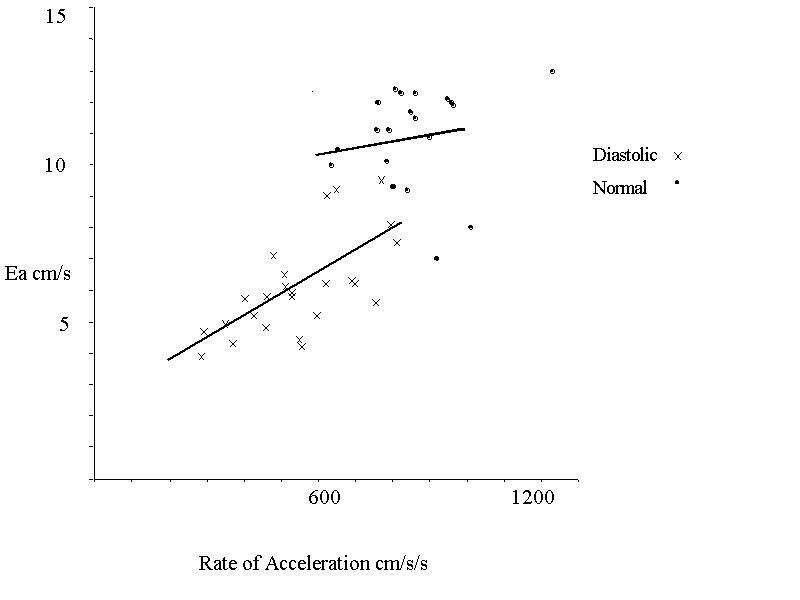 Scatter plot showing the correlation between DTI early diastolic mitral annular velocity (Ea) and acceleration of diastolic flow in patients with diastolic dysfunction and in normal subjects. We have found that in the group with diastolic dysfunction, Ea had a positive correlation to the acceleration of early diastolic filling and in the control group there was no relationship. We know from previous studies that recoil occurs during the isovolumic relaxation period before filling and Doppler mitral annular tissue velocities and Doppler mitral inflow velocities are influence by preload conditions in a normal study population [5, 6]. Therefore because of the dissociation between filling and recoil described already by Buchalter et al  and the influence of preload conditions on the rate of filling the two variables are unlikely to correlate. In the stiff heart however recoil is delayed and filling takes place at the same time under the influence of high filling pressures. In addition preload dependency of these variables is also reduced in the stiff diseased ventricle. Therefore a relationship between the rate of filling and recoil occurs. In the stiff heart a slow release of restoring forces during recoil reduces the early diastolic filling across the mitral valve. In the normal heart however the rate of flow is a result of the potential energy of the maximum restoring forces held when recoil had terminated which results in normal early diastolic filling . This study provides evidence that ventricular filling is associated with early diastolic motion of the mitral annulus, which is a marker for left ventricular recoil in the control group. However this positive correlation is the result of the absence or reduction of the early diastolic mechanism essential for proper filling. It may be argued that in the normal state most people have normal filling pressures and it is primarily the left ventricular relaxation and recoil that influences the trans mitral gradient. Preload however is the force that extends the ventricle in diastole or the force acting to stretch the ventricular fibres at end diastole . Therefore even though the filling pressures are normal preload will affect the rate of blood velocity across the mitral valve depending on the degree of stretch of the left ventricular cavity in diastole. Taking into account the physiological changes that effect preload there should be a varying degree of acceleration of blood flow across the mitral valve, which is dissociated from left ventricular recoil in the normal. Evidence that Ea declines progressively with age and is reduced in left ventricular hypertrophy led investigators to suggest that Ea could be an index of LV relaxation [6, 15, 16]. From these findings it was suggested that Ea measured from the diastolic velocity profiles produced by DTI may provide an index of left ventricular relaxation not strongly influenced by preload variables such as heart rate and left atrial pressure . Therefore mitral E-wave velocity or the velocity of passive early diastolic filling determined by conventional Doppler was corrected for the influence of relaxation by applying the dimensionless index of E/Ea. Ea has been shown to be related inversely to the time constant of relaxation . In previous studies, the ratio E/Ea related well to left atrial pressure and was used to estimate left ventricular filling pressures in stiff hearts . In a canine study, left ventricular relaxation, minimal pressure and transmitral pressure gradients determined Ea in normal conditions. In cases of impaired relaxation the influence of filling pressures was very small [5, 18]. In a study looking at the differentiation between constrictive and restrictive cardiomyopathy using Doppler tissue imaging Ea was found to be reduced even when the mitral inflow pattern was pseudonormal or restrictive . We have observed a better correlation between the rate of early diastolic filling, and Ea in the diastolic dysfunction group without pseudonormalisation than in the normal group. We have also observed a better correlation with three other parameters of left ventricular mitral inflow in the diastolic dysfunction group, the early and late time velocity integrals and the E/A ratio supporting the results of this study. Patients with diastolic dysfunction have increased endocardial and perivascular fibrosis as a feature of altered interstitial structure [20, 21]. The relationship of tissue velocities determined by DTI to the regional amount of interstitial fibrosis has also been established [22, 23]. Therefore altered interstitial composition should manifest itself in the behaviour of Ea. Since diastolic dysfunction exists in all myocardial pathologies and aging its potential use in estimating left ventricular filling pressure is important. Therefore the availability of further evidence to support its use in assessing accurately this clinical parameter is reassuring. The association between elastic recoil estimated by E annular velocity and early inflow acceleration in stiff hearts may be partly due to the relationship in time if the peak E annulus was delayed in the patients with diastolic dysfunction. Therefore if E annulus peaked earlier in normal than in patients with left ventricular dysfunction the timing of this interval or early diastolic mechanism could be of enormous clinical benefit in different clinical settings. The major limitation of this study may be the comparison from different age groups. The purpose of the study was to assess the mechanics of early diastolic filling in stiff and normal hearts regardless of the aetiology of that stiffness. However the mean values adjusted for age are presented. The power of the associations may have been low, as the numbers in the normal group were relatively small (n = 22), however with this number we would have sufficient power (80%) to detect a correlation of 0.55 or above as being statistically significant in this group. Transmitral flow presents a parabolic distribution during progression from normal to advanced diastolic dysfunction characterised by a restrictive pattern. Therefore patients with restrictive physiology and pseudonoarmalisation were excluded from the study. However a further study to show the association between the deficits of elastic recoil estimated by E annular velocity with early left ventricular inflow acceleration in patients with pseudo-normalisation unmasked by the valsalva manoeuvre could yield interesting results. JBF: Editing, advice, quality control, and coordination of the manuscript. FAM. Performed and read the echocardiograms.